Bring the family to the holiday festivities at Wilder Park on Thursday, Dec. 7. The annual holiday Tree Lighting ceremony starts at 5:50 p.m. and is scheduled to end at 8 p.m. The Tree Lighting is always lots of fun, and it features activities your family is sure to enjoy. Everyone here at Elmhurst Toyota looks forward to this event and we hope you can attend this year. In addition to the tree lighting, you can meet Santa and his reindeer, who have arranged to visit Elmhurst in advance of their visit on Christmas Eve. There will be free hot chocolate and cookies for all, and you’ll be serenaded by local choirs who will be singing merry holiday favorites. In the spirit of Christmas, you can bring a new, unwrapped toy to help Toys for Tots. Just look for the collection bins located in the park, as well as inside and outside Wilder Mansion. 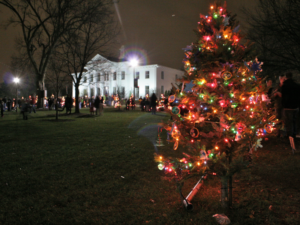 The Tree Lighting at Wilder Park is always popular, with hundreds of Elmhurst residents expected to turn out to experience this treasured holiday tradition. The splendor of Wilder Mansion provides the backdrop as the crowds excitedly count down the seconds until the officials flip the switch that lights the tree against the night sky. Sixty-five other trees in the park will be lit, each one ornamented and decorated by a different Elmhurst business or organization. The delightfully decorated Wilder Mansion is open during the Tree Lighting. It’s an amazing evening you won’t want to miss! The sponsors for this year’s Tree Lighting ceremony include Brewpoint Coffee, Edward-Elmhurst Health, and Mariano’s grocery store and catering. So, dress warmly and head over to Wilder Park to experience this evening of family fun! Thursday, Dec. 7, 2017, 5:30-8 p.m.
Visit www.epd.org or call the Elmhurst Park District at 630-993-8900.